Research Interest: Research interests of Dr. Franck Delplace are in both Physics and Mathematics. Based on his strong experience in fluid mechanics, F. Delplace extended his work to other fields’ theories particularly Einstein’s general relativity describing gravity at large scales. This approach gave the basis of Liquid Space Time (LST) concept which extended general relativity by introducing dynamic viscosity in gravity equations. Following this idea, he obtained a link between general relativity equations and Navier-Stokes equations. He also extended LST concept at atomic scale by modifying well known Plank’s equation in order to introduce the dynamic viscosity of a fundamental medium called LST. F. Delplace also developed mathematical tools for his works in fields theories. For Fluid Mechanics, he developed methods to calculate Riemann zeta function analytical values for odd integers. He is actually developing the approach in order to contribute to famous Riemann hypothesis problem. Finally, he also developed a new definition of curvature in differential geometry which is linked to Laplacian operator in order to incorporate it in field’s equations. Biography: Born in France Aug. 17, 1966, Dr. Franck Delplace started his career as researcher in Fluid Mechanics and Thermal Sciences. After honorary fellowship at Birmingham (GB) University, he was included in the American Who’s Who in Science & Engineering (1998). He occupied technical expert positions in several companies until today at EDF (French Major Electricity Co.). In 2011 he reached the Scientific Committee of ESI Group (Leading French Co. in Numerical Simulation) as an expert in Fluid Mechanics and Industrial Challenges. 1. 2018: F. Delplace: Fluids Flow Stability in Ducts of Arbitrary Cross-Section. J. of Modern and Applied Physics. Under review. 2. 2018: F. Delplace: Shear Stress Produced by Electromagnetic Waves. 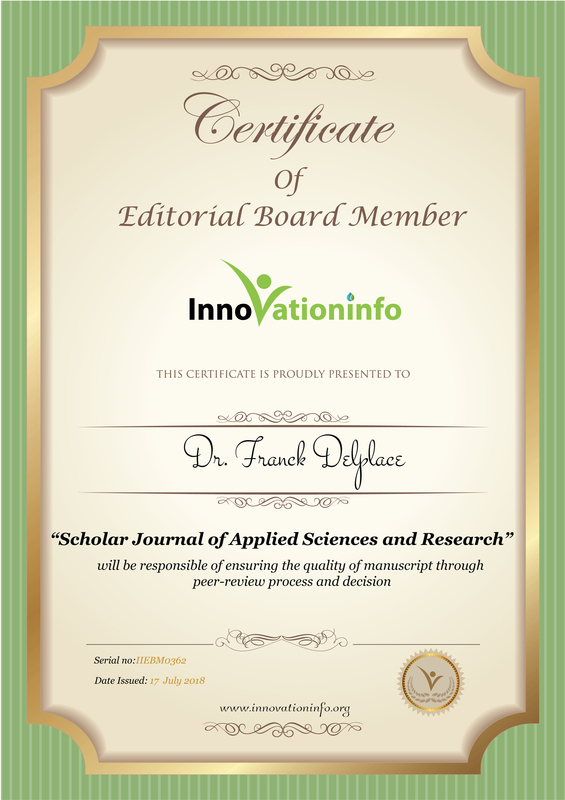 SciFed Journal of Nuclear Science. Vol. 2, Issue 1, p 1-4. 3. 2017: F. Delplace; H.M. Srivastava: Rheology for the Twenty-First Century. Rheology Open Access. Vol.1, Issue 1. Editorial Paper. 4. 2017: F. Delplace: Apéry’s Constant Calculation and Prime Numbers Distribution, a Matrix Approach. Int. J. Sci. Eng. & Appl. Sci. Vol.3, Issue 10. 5. 2017: F. Delplace: A New Definition of Curvature for Polygons, Convex Polyhedra and Hypersolids. Int. J. Sci. Eng. & Appl. Sci. Vol.3, Issue 5. 6. 2016: F. Delplace: Fluid Mechanics at Atomic Scale. Fluid Mechanics Open Access. Vol.3, Issue2. 7. 2016: F. Delplace: Reynolds Number and Spacetime Curvature. Fluid Mechanics Open Access. Vol.3, Issue1. 8. 2015: F. Delplace: Viscous Liquid Spacetime and Its Consequences. Infinite Energy Magazine. Issue 124. 9. 2014: F. Delplace: Liquid Spacetime (Aether) Viscosity, a Way to Unify Physics. General Science J. February 2. 10. 1998: F. Delplace & J.C. Leuliet: An Experimental Study of the Flow of Large Size Alginate Spherical Particles and Fibres Suspensions in Water. Proceedings of Third World Congress on Particles Technologies, Brighton (GB). 11. 1997: F. Delplace, J.C. Leuliet & D. Levieux: A Reaction Engineering Approach to the Analysis of Fouling by Whey Proteins of a Six-Channels-Per-Pass Plate Heat Exchanger. J. Food Eng., Vol. 34, p 91-108. 12. 1997: F. Delplace & J.C. Leuliet: Hydrodynamic and Thermal Performances of Plate Heat Exchangers on Newtonian, Shear-Thinning and Yield-Stress Fluids. Proceedings of the 7th International Congress on Engineering and Food. Sheffield Academic Press. Vol.1, p 13-16. 13. 1997: F. Delplace, G. Delaplace, S. Lefebvre & J.C. Leuliet: Friction Curves for the Flow of Newtonian and non-Newtonian Liquids in Ducts of Complex Cross-Sectional Shape. Proceedings of the 7th International Congress on Engineering and Food. Sheffield Academic Press. Vol.1, p 36-39. 14. 1997: T. Benezech, C. Faille, F. Delplace, J.C. Leuliet & M.N. Bellon-Fontaine: Cleaning in Place: Effect of Hydrodynamic Conditions on Biofouling Removal from Plate Heat Exchangers. Proceedings of the 7th International Congress on Engineering and Food. Sheffield Academic Press. Vol.2, p 25-28. 15. 1995: F. Delplace & J.C. Leuliet: Generalized Reynolds Number for the Flow of Power Law Fluids in Ducts of Arbitrary Cross-Section. The Chem. Eng. J. Vol. 56. P 33-37. 16. 1995: F. Delplace & J.C. Leuliet: Modelling Fouling of a Plate Heat Exchanger with Different Flow Arrangements by Whey Protein Solutions. Trans. IChemE Part C, Vol. 73, p 112-120. 17. 1994: F. Delplace, J.C. Leuliet & J.P. Tissier: Fouling Experiments of a Plate Heat Exchanger by Whey Proteins Solutions. Trans. IChemE Part C, Vol. 72, p 163-169. 18. 1993: F. René, J.C. Leuliet & F. Delplace: Friction Factor and Roughness Measurements of Tubular Mineral Membranes. Experiments in Fluids, Vol. 15, p 175-182. 19. 1993 : Modélisation de la Résistance Hydraulique en Microfiltration Tangentielle d’une Suspension de Levures. Entropie, Vol. 29, Issue 178, p 43-51.